A perfectly painted surface is every car's staple feature. Thus the quality requirements for painted parts attached to the car body are the same as with the body itself. 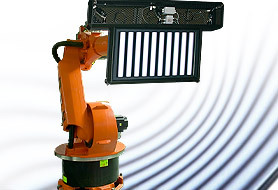 Objective inspection is possible with the reflectCONTROL PSS 8005.D robot-assisted inspection system for large and complex attachments such as bumpers. The defects are measured laterally and in depth and classified on the basis of catalogues and optionally marked during robot-based inspection with the automationCONTROL 8005 PSS 8005.M system using ATENSOR-LS1 technology*. This way, follow-up work and process improvements can be performed precisely as required and easily.